Safari traveling to Tanzania is a unique experience and an opportunity for an adventure of a lifetime. The Great Wildebeest Migration river crossing takes place from July. Wildebeests move towards the north, passing through the Lobo area (located just north of the central Serengeti National Park) and the Wagakuria area (remote northern Serengeti National Park along Mara River) en-route to Kenya’s Masai Mara Game Reserve. The migration can arrive at the Wagakuria area anytime from July onwards and wildebeests can be seen in the area, crossing the Mara River. In September the wildebeest herds are spread out over the northern Serengeti National Park and Kenya’s Masai Mara Game Reserve. Several large herds of wildebeest remain behind in the area and sometimes, only weather changes can bring the herds back into the area from Mara. In October, the herds move south towards the central Serengeti National Park via the Lobo area. Once you arrive at Kilimanjaro International Airport, you’ll meet one of our guides and drive you to your hotel in Arusha for your dinner and overnight stay. After breakfast, we’ll pick you up from the hotel and proceed to Tarangire National Park for a game drive. In the evening, we’ll drive to the lodge for an overnight stay. Tarangire National Park is located in the Manyara Region, and the somewhat drabber Rufous-tailed Weaver and Ashy Starling – all endemic to the dry savannah of North-Central Tanzania. Tarangire’s pythons climb trees, as well as its lions and leopards, lounging in the branches where the fruit of the sausage tree disguises the twitch of a tail. After breakfast from the lodge, we’ll have a morning game drive to the park with picnic lunch. In the afternoon, we’ll depart to Serengeti National for your dinner and overnight accommodation. The park is well-known for its healthy stock of other resident wildlife, particularly the “Big Five”, named for the five most prized trophies taken by hunters; Lion: Serengeti is believed to hold the largest population of lions in Africa due to the abundance of prey species. More than 3,000 lions live in this ecosystem. African Leopard, these reclusive predators are commonly seen in the Seronera region but are present throughout the national park with the population at around 1,000. After breakfast, we’ll proceed to a full day game drive at Serengeti Central Park. Seronera Area, home of lions, cheetah, leopard and other big animals. A million wildebeest, each one driven by the same ancient rhythm, fulfilling its instinctive role in the inescapable cycle of life; a frenzied three-week bout of territorial conquests and mating; survival of the fittest as 40km (25 mile) long columns plunge through crocodile-infested waters on the annual exodus north. Dinner and overnight at Acacia Migration Camp. 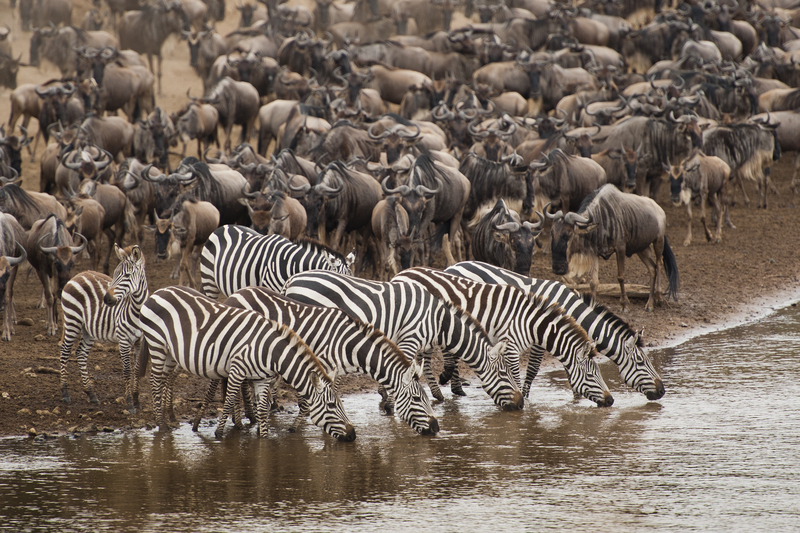 After breakfast, we’ll depart for Serengeti North Kogatende where you will see the great migration crossing the river. Drive back to the camp in the evening. River crossings at Kogatende start to occur every day in August as the mega herd settles into the area. For August, September and October, game viewing up here is superb with river crossings pretty much guaranteed every day. There is no distinct movement as the herds tend to cross back and forth over the river, following the rains and subsequent fresh grasses. It is not uncommon to see different herds crossing in different directions on the same day. After breakfast, we’ll have a game viewing of the Great Migration at Mara Area. Back to the camp by evening for campfire and dinner. Resident wildlife numbers are exceptionally high in the Wagakuria area, with prides of lion up to 30 strong, however from August to October the area turns into a wildlife paradise. The key feature is the Mara River and it is not uncommon to see the herds cross the Mara River north on one day and then back south a few days later. Please take note – finding a crossing is very difficult and is sometimes a matter of luck. . A herd can be seen next to river and only decide to cross or not cross until a couple of days later. This area is a stunning region with kopjes, woodland, riverine vegetation and open plains, similar to Kenya’s Masai Mara Game Reserve. Overnight at Acacia Migration Camp. After breakfast, enjoy the morning game drive in the Serengeti National Park and depart by afternoon for Ngorongoro Conservation Area Olduvai Gorge Museum. Oldupai Gorge (originally misnamed Olduvai) and Maasai visit, is the most famous archaeological location in East Africa and has become an essential visit for travelers to Ngorongoro or Serengeti. At Laetoli, west of Ngorongoro Crater, hominid footprints are preserved in volcanic rock 3.6 million years old and represent some of the earliest signs of mankind in the world. Dinner and overnight at the Ngorongoro Sopa Lodge. This day we will start early morning for the game drive (with a picnic lunch) inside the Ngorongoro Crater. We’ll depart in the morning for a game drive at Lake Manyara National Park with picnic lunch. In the afternoon, we’ll drive back to Arusha for your flight back home. Manyara provides the perfect introduction to Tanzania’s birdlife. More than 400 species have been recorded, and even a first-time visitor to Africa might reasonably expect to observe 100 of these in one day. Inland of the floodplain, a narrow belt of acacia woodland is the favored haunt of Manyara’s legendary tree-climbing lions and impressively tusked elephants.